The entrance sign for the manufacturing plant that houses Invista, DuPont and Korda is seen Thursday, Dec. 3, 2015, in Chattanooga, Tenn.
1944: Dupont buys 500 acres of land near the then-new Chickamauga Dam. 2004: DuPont sells its textiles business, which included some of its best-known brands such as Lycra (Spandex), Dacron polyester, Orlonacrylic, Antron nylon and Thermolite, to Koch Industries. 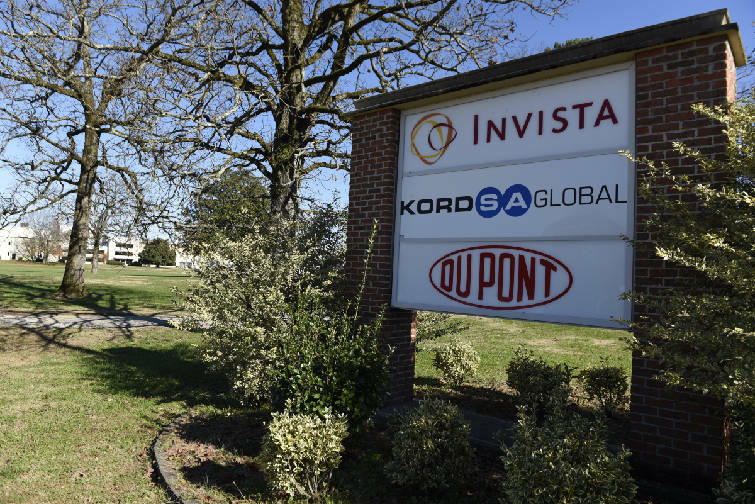 Invista, a subsidiary of Koch, takes ownership of the Chattanooga plant and leases space for a limited performance polymer operation to DuPont and a tire nylon operation to Kordsa. 2015: DuPont merges performance polymers division with industrial polymers division and phases out the last of DuPont operations in Chattanooga. Nearly 60 years after DuPont built one of Chattanooga's biggest manufacturing plants, the chemical giant is closing down the last of its local operations this month. DuPont, which sold most of its 500-acre Hixson nylon production plant to Koch Industries in 2004, said Thursday the only remaining part of its business in Chattanooga — a performance polymers lab and production facility — is shifting to a plant in Richmond, Va.
About 40 workers, including 26 employees and 14 contractors, will lose their jobs at the end of the month, although DuPont and its contractors say they will try to find other work for the displaced employees. The decision follows DuPont's announced merger of its performance polymers unit with the company's packaging and industrial polymers division. Invista, a division of Koch Industries, and Kordsa, a Turkish maker of nylon for tires, will continue operations at the Chattanooga plant on Access Road. Those companies took over most of the DuPont operations more than a decade ago and together still employ more than 600 workers, plus several hundred more contractors. "In an effort to streamline operations, DuPont Performance Polymers is consolidating its manufacturing footprint," DuPont's Chattanooga Plant Manager Mike Kirkland said in a statement Thursday. "As a result, the business will cease production of nylon specialty polymer at its Chattanooga site by the end of 2015." At its peak more than four decades ago, DuPont was one of the city's biggest employers, with more than 5,000 workers. "DuPont was a mainstay of our economy for decades and was not only one of the biggest employers but also one of the greatest supporters of the community," said Ray Childers, a former president of the Chattanooga Manufacturers Association for 18 years and a former personnel manager at DuPont. "It's sad to see the DuPont name leave Chattanooga." Jim Wright, a 71-year-old retiree who began his 40-year working career at the DuPont plant before moving to Texas, recalled the 1970s, when it was a challenge to find a space in the acres of paved parking lots around the Hixson plant. "There were so many employees and cars that we couldn't all get in the parking lot at shift change and sometimes you had to park out on to Access Road," Wright recalled. "The fibers operation required a lot of employees in that era so DuPont was a major player in Chattanooga." But the shifting of textile and apparel operations overseas, automated manufacturing, and new technologies and products reduced the staffing needs even with three different companies — Invista, Kordsa and DuPont — operating under the same roof. The corporation will provide career transition support this month for the laid-off workers, who may apply for open positions at other DuPont facilities, according to Tara Stewart, public affairs director for the Southeast. Contractor Mundy Companies will lay off its staff at the plant. But Robert Short, vice president of human resources for Mundy in Houston, told WRCB-TV those employees should be able to find other work in the Chattanooga area on other Mundy projects. Kirkland acknowledged that closing DuPont's Chattanooga operations at Christmastime "can be difficult for those impacted," but he said the decision "was very carefully considered" and is designed to help DuPont improve efficiency of its polymers units. Zack Crane said DuPont was "very transparent" about the potential of its operations in Chattanooga being phased out. "They even told me about it when I interviewed there in 2013," Crane said in a Facebook post. "Everybody knew this was a strong possibility. Of course it still stinks for all those involved, but it's hardly the evil corporation."